AMD released Radeon Software Crimson ReLive Edition 18.2.1 driver. 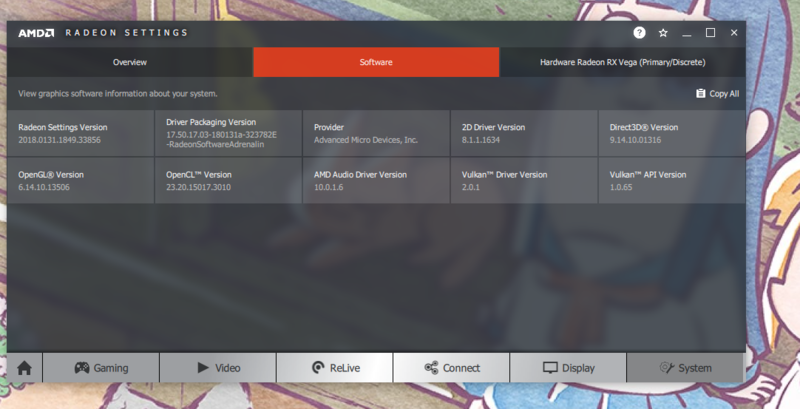 Radeon Software Adrenalin Edition, the driver now has been WHQL certified. AMD added support for Final Fantasy 12: The Zodiac Age as well as resolving Freesync issues, Civilization V and others. Nice, probably tomorrow would be my guess too but it could be a later night (Local time for here in Sweden.) release too since it's already partially online though restricted. IMO it will hit us Tonight, with some Bugs squashed. All in all i don't have any issues with this driver. Romulus_ut3 (yeah You MF ) for keepin' Repository updated. about time they fix it. I found a working solution for this also Turn OFF any V.Sync + Give 70/64FPS on my screen (70Hz BTW) or Disable Chill for some other games. Yeah I was doing that but they fix it now. I just noticed this had been released, installed them and did the usual setting up and cleaning out the previous driver files. The line was incremented with a .1, not entirely sure what's that about. Also appears to be WHQL and signed by both AMD and Microsoft so all the mobile GPU entries are back in the INF again compared to AMD's beta driver releases. There's a couple of settings added for some of these GPU's too. AMD6863.1 = "Radeon Vega Frontier Edition" <- This is gone in this driver, no longer installs on Frontier GPU's as a result? Since there's so many variations of mobile GPU models it looks like there's been a lot of adjustments but as mentioned these entries are usually gone from AMD's beta driver releases and present in the full WHQL sets. And then the Atiapfxx.blb file. Assassin's Creed Origins DXX profile now also encompasses DiscoveryTourAncientEgypt.exe for the tour mode coming later this month. I like to get my drivers early. Thank you. From Reddit about the 100% GPU bug that someone mentioned. Hey just to let you know we do know about this issue - and it turns out to be pretty complex to resolve. As a workaround for now you can kill the AMDDVR process which should return the GPU utilization to the correct levels. I had the impression that this happened because I have a secondary 60Hz monitor and Windows 10 was messing up with the primary freesync monitor somehow since AMD never listed it as a known issue. Hopefully it is also fixed when playing videos in browser since it's where it sometimes happens for me. first time problem ever, these drivers don't allow me to create usual Eyefinity setup. My monitors start flickering like crazy then system hangs until it's atikmpag BSOD. Coming back from sleep mode still causes a crash.